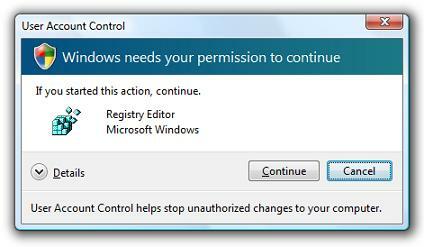 If you’ve used Windows Vista for any great amount of time, you have most likely seen UAC (User Account Control). UAC is that annoying, nagging, “Windows Needs your permission to continue” popup window that seems to appear whenever you attempt to run just about any program. The UAC prompt typically occurs when attempting to run any program that requires administrative rights in Windows Vista. In this tutorial, I will show you how to disable the Vista administrative permissions prompt. However, before proceeding you should know that disabling UAC can lead to a less secure system. Although, most likely no less secure than Windows XP. There is such a thing as over protective! That’s all there is to it. Now you won’t be annoyed by the Windows needs your permission to continue prompt anymore while attempting to run programs from Windows Vista.